PolarPro is an American filter company offering products for many different types of cameras, including high-end still cameras, video-centric cameras, action cameras and drones. They also make other accessories, such as mounts and cases. I recently had the chance to shoot with two products from the company's QuartzLine filter series: a Cinema Series circular polarizer and an ND16 solid neutral density filter. Looking first at some of the specs and features of the QuartzLine circular polarizing filter, it is made of 99.9 percent pure fused-quartz glass, promising durability and clarity. The circular polarizer is constructed using a single lens element and produces a refractive index of only 1.46. PolarPro promises zero color shift thanks to a special coating. The glass element can resolve sensors up to 400 megapixels, so it should be plenty sharp for every camera available. With respect to the build of the filter, its ridged brass frame is excellent. It is fairly thin, but plenty wide enough to easily rotate the filter. Not only is the rotation smooth but threading it onto and off the filter has proven smooth as well. There's very little more frustrating in photography than dealing with a poorly-threaded lens filter. PolarPro QuartzLine circular polarizing filter on the Fujinon GF 32-64mm f/4 lens. The PolarPro QuartzLine filter has a very nice brass ring. The ridged surface allows for easy rotation when putting on/removing the filter and when rotating it during shooting. It is not only the build quality of the filter itself which proves impressive, but the quality of the packaging and the included accessories as well. The filter arrives in an attractive and stylish box and when you open it up, you are treated to a very nice padded soft case which contains a hard clamshell-style case for the filter. Both the padded soft case and the protective hard case are labelled, which is great for photographers using multiple different types of filters. Further, the soft case includes a sewn-in microfiber cloth, perfect for quickly cleaning your filter. Inside the hard case, there's a foam insert with a cut out for the filter and four small indents for you to be able to lift the filter, which fits snugly into the case. It's a very good case and paired with the padded soft case, I can't imagine what sort of abuse would be required to damage the filter during travel. The PolarPro QuartzLine filters come with a hard case which contains a padded interior. In addition to the hard case, the PolarPro QuartzLine filters also come with a padded soft case, which includes a sewn-in microfiber soft cloth. Both the soft case and hard case are also labeled so you can keep your filters straight if you have more than one PolarPro filter. As far as image quality is concerned, I am very impressed by the PolarPro QuartzLine circular polarizing filter. Its polarization works well and the filter produces no perceptible decrease in sharpness, as you can see in the 100 percent crops below. Further, the filter does not produce a color cast. 100 percent crop. No filter. 100 percent crop. Polarizing filter attached. On the left, we see this scene without polarization. On the right, the effect of polarization is clear. A common use of a polarizing filter is to make a sky bluer, but this effect can be replicated in Photoshop. However, my most common reason to use a polarizing filter is to reduce reflections on water, which cannot be accomplished through simple editing on a computer. This is why a polarizing filter is a must-have part of any landscape photography kit. The ND16 neutral density filter is much like the circular polarizer, including its primary specs and features, although it obviously doesn't rotate like the polarizing filter and is thus a bit thinner. I was able to successfully stack the filters with my GF 32-64mm lens (25-52mm equivalent focal length in 35mm terms) and experienced only minor vignette in the extreme corners when shooting at the widest focal length. Otherwise, stacking them worked nicely. Another concern is that the polarizing filter does result in some additional flare, as you can see in the extreme test shot below. In normal shooting situations, it likely won't be much of an issue, although it is something to keep in mind as you may need to be a bit more careful when shooting toward the sun. Any polarizing filter I've used has resulted in some additional flare when shooting toward the sun and the PolarPro filter is no exception. I wouldn't say it is particularly better or worse than other high-end polarizing filters I've used in this regard. When shooting at 32mm (25mm equivalent), there is some vignette in the extreme corners. The experience with other wide-angle lenses may vary. Like the circular polarizing filter, sharpness through the ND16 was very good and there was no noticeable color shift. And like the circular polarizer, the ND16 came with identical excellent packaging and included cases, except with ND16 markings rather than CP markings. GF 32-64mm lens at 32mm (25mm equiv. ), f/11, 4s, ISO 100. Image processed to taste in Adobe Camera Raw. By using a polarizer, I was able to cut down the reflection of the sky on the water in the foreground. 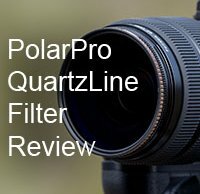 The PolarPro QuartzLine circular polarizer and neutral density filters are available in numerous sizes and types. The available sizes are 37mm, 46mm, 67mm, 77mm and 82mm and you can purchase adapter rings for any in-between sizes. Available filter types are: ultraviolet (protective), circular polarizer, ND8, ND8/PL, ND16, ND16/PL, ND64, ND64/PL, ND1000, ND1000PL and ND100k. Prices range from around $50 to over $200 depending on the filter type and size. The 77mm filters I used both cost $199. You can purchase the filters via the links below. Overall, I am very impressed with both the QuartzLine polarizing filter and the ND16 filter. They are very high quality in terms of packaging, build and optics. If you are looking for a high-quality filter, I highly recommend looking at PolarPro's offerings. For the purposes of this review, PolarPro sent me the filters, free of charge. No other compensation was received.